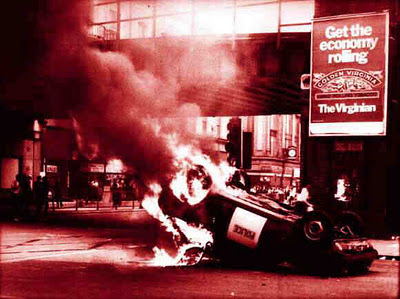 Transpontine investigates some previously confidential Government papers, released to the National Archives at the end of December 2011, which provide some insights into the riots that swept across England in July 1981. Included in the papers is some information on events in South London, which combined with contemporary press reports gives an idea of what happened in the area at that time. Included in the documents is a briefing from the F4 division of the Home Office (responsible for links with security services, special branch etc) with details from the Metropolitan Police of disturbances on Thursday 9th July: ‘At 7:24 pm 100 black youths and 50 white youths were reported at Woolwich, but there was no trouble… at 8.42 pm disturbances broke out at Woolwich, with youths throwing stones and overturning vehicles. Serials had previously been deployed to the Woolwich area for the Anti-Nazi League meeting and these, supplemented by the Special Patrol Group and Urgent Response Units deployed from Operations Room, moved into the area to prevent trouble… At 10.35 pm disturbances broke out at Lewisham … During this time the disturbances at Woolwich were continuing’. Statistics from the Met’s ‘R’ district (Woolwich) showed that 37 people had been arrested in Woolwich, with four minor injuries to police, 8 windows broken and two cars overturned. ‘P’ District (Lewisham) reported 10 arrests. The Times reported these events the next day: 'London police quickly quelled what threatened to be a riot early yesterday evening in Woolwich, south-east London. About 200 black and Asian youths ran through the town centre smashing 15 shop windows and overturning two cars. There was some looting. The youths were outnumbered by police who quickly dispersed them. 27 arrests were made… In Lewisham, eight youths were arrested after clashes in which goods were looted from Chiesman’s department store. About 100 black youths in Deptford threw bottles at a police car (Times, 10 July 1981). The Woolwich events seem to have been provoked by rumours of a racist skinhead invasion to attend a gig at the Tramshed (a similar occurence had led to the riots in Southall in the previous week). According to the Deptford and Peckham Mercury (16 July 1981), people initially gathered on the streets to defend local venues thought vulnerable to racist attack - groups were reported at local Sikh temples in Calderwood Street and Masons Hill (where an Anti Nazi League meting was taking place), a mosque in Thomas Street, and the Simba project (an African-Caribbean community group). An (untrue) rumour that the skinheads were arriving on the Woolwich ferry prompted hundreds of mainly young people to run down Powis Street, and it was here that shop windows were broken and cars overturned, with a tobacconist shop being looted. The same paper reported that on that night too, bottles were thrown at police by a crowd on Tanners Hill, Deptford (presumably the same incident referred to in The Times). In Balham High Road 'Around 35 shops were damaged in a wave of violence which started shortly after midnight when some 200 youths roamed the streets. Worst hit was the Argos Discount Store where hundreds of pounds worth of goods were stolen' (South London Press, 14 July 1981). On the following Friday night, two cars were overturned in Daneville Road, Camberwell (Mercury, 16 July 1981), while 'a 15 year old youth was arrested in Rye Lane, Peckham, for allegedly throwing a petrol bomb at police' (South London Press, 14 July 1981). The trouble in Lewisham seems to have been fairly sporadic, prompting some self-congratulation from the police in the South London Press: 'Lewisham has escaped almost trouble free from a week of rioting in Britain's inner cities thanks to sensitive policing and public co-operation, a police chief said yesterday. Apart from a window being smashed at Chiesman's in Lewisham High-St, and a minor stone throwing incident in Sydenham on Saturday where three people were arrested, there have been no repeats of the mass looting and rioting which has hit many areas. Although many shopkeepers have taken the precaution of boarding up their windows and police have been issued with protective clothing and headgear, P District's acting commander Dennis Rowe said that he is "delighted" the borough has remained peaceful. 'Although many of our officers have been drafted into other areas where there have been riots and the ones left behind have had to work long hours, they are still endeavouring to remain patient and to police the area sensitively... I am aware that while we have to continue to remain firm and to make those arrests that are correct, we can still keep sight of the need to be understanding. Through a concerted effort by our liaison officer and home beat constables along with a tremendous spirit of co-operation by local community groups, youth leaders and the general public we have been successful... We are even getting a feedback from a number of black and white youths who are proud of their borough saying "This is our town and we don't want to smash it up' (SLP 17 July 1981). Many local black people probably had a less rosy view of community-police relations, particularly in the aftermath of the New Cross Fire in January 1981. Indeed there was renewed controversy in July when police warned that a planned New Cross Massacre Action Committee fundraiser couldn't go ahead for licensing reasons at the Evelyn 190 Centre in Evelyn Street, Deptford ('Clash over fire victims' disco', Mercury, 16 July 1981). Battersea was another flashpoint: 'A gang of youths attacked four policeman on Sunday afternoon [12 July], striking them to the tarmac floor of the roller skating rink in Battersea Park. Two PCs - Robert Smith and Brian Tullock - were rushed to hospital with serious head wounds. PC Smith needed 13 stitches. "It all started when we answered a call saying a car had been overturned in the park, said Det. Con. Larry Lawrence, "Four of us were in plain clothes but as soon as we identified ourselves we were attacked by about 20 youths carrying hockey sticks and wooden staves. The blows rained down on PC Smith and PC Tullock was given a severe kicking". Mr Lawrence said a crowd of 200 stood watching. "The only human touch there was a girl who took off her cardigan and wrapped it around PC Smith's head as he lay bleeding". A crowd of youths carrying hockey sticks and wooden staves ran through the park during the early evening damaging two cars and throwing petrol bombs at the police'. 'Later in the evening three policeman were injured in Francis Chichester Way when 35 youths hurled missiles and fire bombs at police lines. The incidents followed outbreaks of violence on Saturday night when 17 arrests were made in Queenstown Road and Falcon Road area' (South London Press, 14 July 1981). ''Violence returned to the streets of Brixton this weekend, a few hours after Lord Scarman finished part one of his enquiry into the April riots. Large crowds clashed with police, cars were overturned and set alight, shops were attacked and looted only a short distance from Lambeth Town Hall where GLC leader Ken Livingstone was addressing an Anti Nazi League meeting. His audience had a grandstand view as officers fought looters... 31 officers were hurt and there were 157 arrests, mainly for looting and assaulting police. Trouble started at about 4 pm when police arrested a Rastafarian called Maliki in Atlantic Road. A popular disc jockey and community leader Lloyd Coxsone (32) tried to intervene but was arrested for obstruction. Within minutes youths had set up barricades across Atlantic Road... Police reinforcements were quickly on the scene but at 4:30 a Panda car in Atlantic Road was overturned and set on fire. An unmarked car which came to its aid was also overturned and fired but officers escaped unhurt. Police formed themselves up in squads of about a dozen men with a sergeant in command. They lined up along the main road, walking under cover of riot shields towards the crowds. They were apparently trying to disperse the mob along Effra Road and Brixton Hill... By 8.30 police had cleared the centre of Brixton' (Source: South London Press, 14 July 1981). Prime Minister Margaret Thatcher visited Brixton police station in the early hours of the 14 July, following a meeting at New Scotland Yard where predictably senior officers lobbied for greater police powers and more riot equipment (the National Archives papers include a report of this meeting, and of arrangements to provide riot helmets and plastic bullets from the army to the police). Then on 15 July there was further trouble in Brixton following controversial police raids on Railton Road. The Government papers in the National Archives includes a detailed report of these raids, supposedly prompted by reports that petrol bombs were being stored there. Eleven premises were raided, numbers 35, 37, 47, 52, 54 and 60 Railton Road under warrants obtained under Section 187 of the Licensing Act 1964 ‘suspected of being used for unlawful drinking’, and 50, 56, 58, 62 and 64 under section 6 of the Criminal Justice Act. Several of the properties were semi-derelict and due for demolition. 176 CID and uniformed officer were employed ‘to enter the premises and a further 391 officers were either held in reserve or employed in cordoning off the area’. The report admitted that ‘No evidence was found during the operation of the manufacture of petrol bombs or of premises being used for illegal drinking that evening. Seven people were arrested, all for minor offences’. ﻿﻿Details in the report do give some indication of social life on 'the frontline' (as that part of Railton Road was known) at that time: at 47 ‘a new record player and a small quantity of drugs were found’; at 54 Railton Road, there were ’25 to 30 people on the premises’; at 58 the police paid compensation for damage to a space invaders machine and a pool table; at 62 ‘The ground floor of these premises was used as a quasi-masonic temple and at the time of the raid two ceremonial swords were laid out on the floor and other items of regalia stored in a cabinet.’ (Report of Enquiry by Deputy Assistant Commissioner Dear into Police Operations in Railton Road, Brixton on Wednesday 15 July 1981). 'Joseph Francis (17), who was asleep when the raid occurred, said his unlocked bedroom door was axed by two policemen. He said a woman and baby in the room were thrown to the floor when the mattress was dragged from under them and furniture was ripped open. Mr. Gladstone McKenzie arrived at his shop, the Railton Free Off Licence, to ﬁnd the door and windows smashed and the back room ransacked. He said he had always had a good relationship with the police and was shocked by the extent of the damage. Some upstairs windows looked as though they had been broken from are inside as most of the glass was lying outside. 100 youths were involved in running fights with police in Railton-rd. on Wednesday night. Petrol bombs, stones and bottles were thrown and 10 officers were injured. The trouble started just after 11 p.m. when two cars were set alight and a barricade of corrugated iron and timber set up behind them. But the police, drawn up in strength at the junction of Railton-rd. and Coldharbour-lane, made no move. Masked youths, one carrying a long stave, then charged the police lines, hurling missiles but were quickly driven back. A fire engine attempting to reach the burning cars was stoned. There was another scare when a convoy of eight powerful motorbikes ridden by white youths roared through the riot area. At 11.45 police started cautiously moving up Railton-rd behind a wall of riot shields and sealing off side roads. Another large force was meanwhile approaching from the Herne Hill end. It was at about this time that the first petrol bombs were thrown. By 12.15 the barricade was being removed and police were in control of the area, though they remained on guard for some hours' (South London Press, 17 July 1981). A briefing report for Ministers included in the National Archives papers highlighted the involvement in left-wing groups, particularly in the Brixton area: ‘There is considerable evidence of activity by extremist organisations that have been hit by some of the worst of the recent violence' though it acknowledged that 'It seems unlikely that in any major case extremists have actually instigated the violence’. The report doesn't say that the radical left seems to have been too fragmented into rival groups to co-ordinate any kind of large scale effective action, but it does provide evidence of this. The report mentions the Labour Committee for the Defence of Brixton founded following the 1981 riots at the instigation of the ‘Militant Tendency’ and operating ‘from an address in Railton Road’; ‘the Workers Revolutionary Party has a books hop in Atlantic Road and a Youth Training Centre in Stockwell’; ‘the Revolutionary Communist Group has its headquarters in Railton Road’; ‘the Revolutionary Communist Party set up a Lambeth Unemployed Workers Group shortly before the Riots, and has since formed a South London Workers Against Racism group, similar to the East London Workers Against Racism which attracted some notoriety for organising vigilante patrols’; ‘the Race Today Collective has offices in Brixton. The edition [sic] of its magazine is Darcus Howe, who has been associated with campaigning in support of the H-block hunger strikes, the New Cross Massacre Action Committee’; ‘After the riot the Socialist Workers Party circulated a leaflet in Brixton in which it said “it was a magnificent way for Brixton to fight back"’ (Brief for a Debate on Recent Outbreaks of Civil Disorder in Great Britain). As reported at Greenwich Phantom, following the riots the River Way Police Holding and Training Centre was created for a couple of years on Greenwich peninsula (Greenwich Council published a critical report in 1984 on 'Riot Training in Greenwich'). 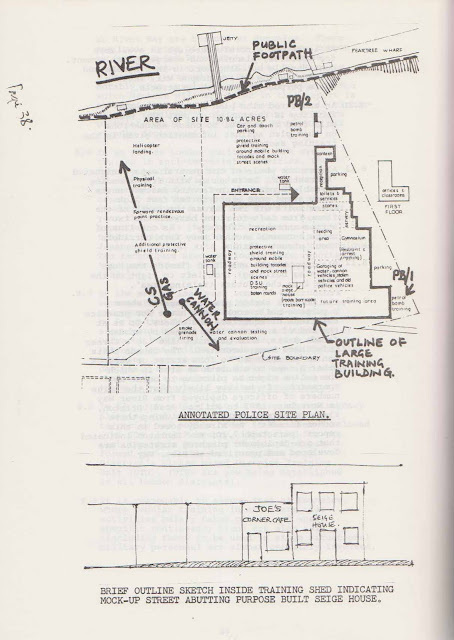 The map shows that this included a mock-up street and areas for petrol bomb, CS gas, water cannon and smoke grenade training.